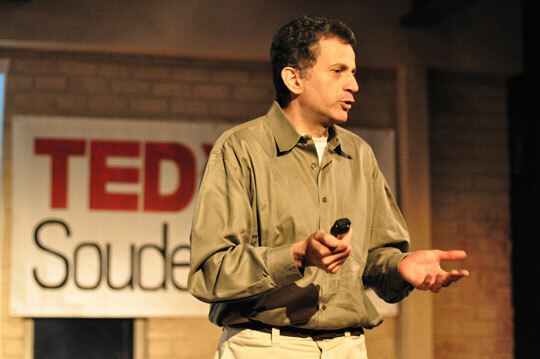 Jacques Sapriel at TEDxSoudertonHS in 2012During the 2008 Philadelphia mayoral election, the Academy of Natural Sciences hosted a series of debates centered on sustainability issues. If you don’t remember hearing about them at the time, Jacques Sapriel wouldn’t be surprised. That anger-fueled inspiration led Sapriel to design PhillyEcoCity.com, envisioned as a hub for eco-conscious citizens to meet, discuss and find information. The site features a news blog, an event calendar, a database of green organizations in the region and forums for green jobs and volunteer opportunities. Originally from Strasbourg, France, Sapriel initially became concerned about the environment and climate change during the energy crisis of the 1970s. That concern has only grown in the three decades since he arrived in Philadelphia, heightened, he says, by the fact that he has two sons, both now in their twenties.